The anatomy of the shoulder girdle consists of several joints, or “articulations”, which connect the upper limb to the rest of the skeleton and provide a large range of movement. You may also see this referred to as the “pectoral girdle” in some textbooks. The three bones which form the shoulder girdle are the clavicle, the scapula, and the humerus. This bone is quite complex and is an attachment site for numerous muscles which support movement and stabilisation of the shoulder. It overlies the 2nd – 7th ribs is tilted forwards by an angle of 30° and is encased by 17 muscles which provide control and stabilisation against the thoracic wall (the ribcage). This is sometimes referred to as the “Scapulothoracic Joint” although it is not technically an actual joint. 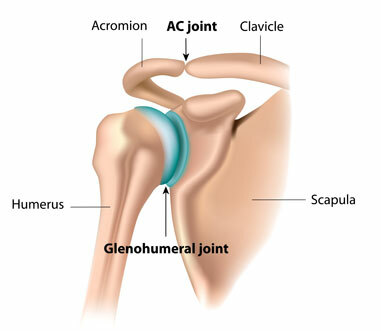 The Acromioclavicular Joint (ACJ) is formed by the lateral end of the clavicle articulating with the medial aspect of the anterior acromion. The Sternoclavicular Joint occurs at the sternal end of the clavicle, the cartilage of the first rib, and the upper and lateral parts of the manubrium sterni (the upper part of the sternum, or breastbone). It is the only joint that truly links the upper extremity to the axial skeleton, via the clavicles. The Sternoclavicular Joint functions in all movements of the upper limbs and is particularly important in throwing and thrusting movements. Serratus Anterior which holds the medial (inside) angle of the scapula against the chest wall.